Notes: Based on the manga by Yoshizumi Wataru. This movie is the retelling of the first episode of the Marmalade Boy TV series ... except from the perspective of Matsuura Yuu, the male lead of the series. Yuu has just found out that his parents are getting a divorce and swapping partners with another couple, so he goes out to visit what will soon be his neighborhood. While walking through a park, he notices a very cute girl playing tennis, and then watches as she gets into various hijinks with a bunch of kids dressed up as wannabe Power Rangers. Love at first sight? You bet. And then he realizes who she really is. 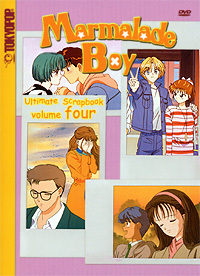 Surprisingly enough, this was the first Marmalade Boy I ever saw. And it's not a bad thing, either, because this movie was actually not a spoiler for anything that goes on in the series. It's just as valid a beginning as the first TV episode, since it runs concurrently. In retrospect, it was really interesting to see the different point of view on the same events, as well as what's running through the heads of characters we hadn't been able to peep into before. Plus you can really understand just why Yuu falls so hard for Miki, especially with the whole Gastaman sequence (which is simply cute). Animation is slightly above the TV series (suddenly there are cherry blossoms *everywhere*), and as a one-shot, does not rely on the stock footage the series does. Acting is, well, just as in the TV series. Melodramatic, yet realistic. Fans of the series will appreciate the addition of backstory to Yuu, as this gives a better idea as to why he's so determined to make things work with Miki. Of course, it also paints him as a bit of a stalker weirdo (especially if the audience isn't familiar with the character), but cut him some slack, he's a teenager! The one major drawback to this movie is that it really doesn't work as a standalone. Yeah, you have these cute people walking around, but you don't really know who they are or why they're thinking they way they do unless you're familiar with the series. Overall, a decent watch, whether you're starting out watching the series or are a bonafide Marmalade junkie. Not groundbreaking by any means, but it's like another episode of the show. Fun, light, sweet, and charming. Recommended Audience: All ages. No objectionable material whatsoever. In fact, it was really cute! (You WILL like the Gastaman team.) Best for fans of the TV series.